Welcome to the travelogue of our Greek Island honeymoon. From June 12th to June 24th, we traveled with Gate1 Travel to the Greek Islands on their 13 Day Greek Islander with Crete package. 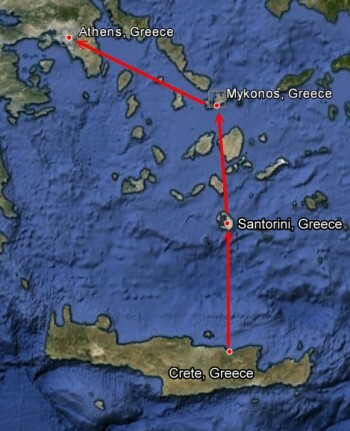 Our destinations were Crete, Santorini, Mykonos, and Athens. Stats: 5 flights, 4 hotels, 3 ferries, 2 rental cars, one great trip. There's no need to close the pop-up window each time as the window will automatically resize when you select a different photo. You will also find map icons throughout the travelogue. If you click on one of these icons an interactive map showing you the exact location will display. If you'd like to view the map on a separate page on Google Maps, simply click the Google logo on the map. If you'd prefer to view all the locations we visited using Google Earth, you can download the kmz file. This file can also be used in many map apps and you can use it as a starting point for planning your own trip. Please keep in mind that while the information in this file was accurate in 2012, some things may have changed since then.